Yesterday a long lunch with friends, wine drunk for pleasure a different experience than when attempting to arrive at an assessment of quality. To start, two examples of méthode ancestrale, Domaine Vincent Câreme Vouvray L’Ancestrale 2012 and Vondeling Rurale 2014, the former possessing a very fine bubble and extremely savoury, the latter from Chardonnay and more funky. Then a bottle of Reyneke Reserve White 2011, which was stellar and disappeared all too quickly – and yet somehow quite liberating to swig great wine rather than ruminate about it too much. 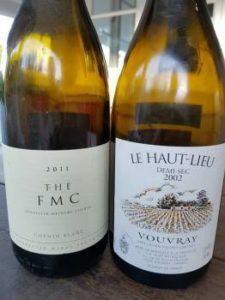 With the chicken satay, a bottle of Huet Le Haut-Lieu Demi-Sec Vouvray 2002 next to Ken Forrester The FMC 2011 – the Vouvray appearing ever so slightly tired, the FMC showing really well and a great accompaniment to the food. With braaied chops, the Vergelegen G.V.B. Red 2012 which looked very composed and surely has a long life ahead of it. After lunch while kids swam in the pool, a bottle of the unheralded Chenin Blanc Reserve 2015 from Barton Vineyards in Bot River which had a wonderful apple-like intensity to it despite a relatively modest alcohol of 13.5%.